Square-shaped green panels with white borders and a face. Creates panels to cross large pits. Flip Panels (also known as Snake Panels) are objects which make their debut in the Nintendo 3DS game Super Mario 3D Land. When the green "!" 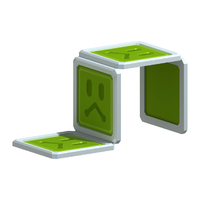 button is pressed, they create several connected green panels with faces that help Mario cross large gaps or hazardous elements, similar to Snake Blocks. After a certain time, these panels will turn dark green, open their mouths, and start to disappear. When all panels disappear, the player can step on the "!" button to create the Flip Panels again. Flip Panels appear in World 2-1, World 2-2, World 4-5, Special 2-5, Special 6-3 and Special 8- . Flip Panels reappear in the minigame Blown Hover from Mario Party: Island Tour. Flip Panels also appear in the stage 3D Land in Super Smash Bros. for Nintendo 3DS and Super Smash Bros. Ultimate. They can be found in the first scrolling section of the stages as platforms. Flip Panels reappear in Captain Toad: Treasure Tracker, having the same function that they do in Super Mario 3D Land. The green "!" button that produces the panels now turns orange if the player presses it. Flip Panels appear in Flip Panel Footpath, Secret of the Golden Realm and Mummy-Me on Flip Panel Footpath. The Flip Panels in Special 8-Crown are the only Flip Panels that do not need to be activated by stepping on the main panel. ↑ Captain Toad: Treasure Track level name of 4-9 "Mummy-Me on Flip Panel Footpath"
This page was last edited on December 11, 2018, at 03:14.